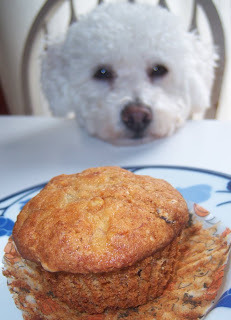 Boy, did Charlie want to have a bite of these muffins! He couldn't, though, because there were chocolate chips in them. I found the recipe on the fabulous blog, Chocolate & Zucchini, a woman who lives in Paris and has published a couple of cookbooks. I can't read it regularly because I find myself getting too envious! The original Chocolate & Zucchini recipe is here. These were a nice way to use up a couple of black bananas, because they were a tasty breakfast. I added some white whole wheat flour to add some whole grains, and some chocolate chips ... because chocolate chips make everything better! Preheat the oven to 360 F (that's right - because it was adapted from a European recipe! ), and line regular muffin tins with paper liners. In a large mixing-bowl or in a food processor, cream together the sugar, the egg and the butter. In a separate bowl, mash together the bananas and milk. In another separate bowl, sift together flours, baking powder, and baking soda. Add the flour mixture to the butter mixture in three parts, alternating with banana-milk mixture in two parts, stirring by hand until just combined (don't overmix). Stir in the pecans and chocolate chips. Scoop the batter into the muffin tins and bake for 35-40 minutes, or until the muffins are nice and golden. Allow to cool for a few minutes then turn out on a rack to cool. Charlie isn't posed ... he jumps into a picture whenever I take one. Seriously!